Get a jump & don’t be stumped for gift ideas on the looming list! 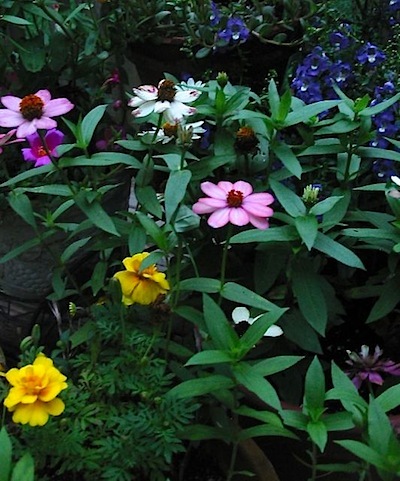 Consider nature! A fab offering that shortens the distance between feathered friends and humans can be one that’s used everyday and for many seasons to come! 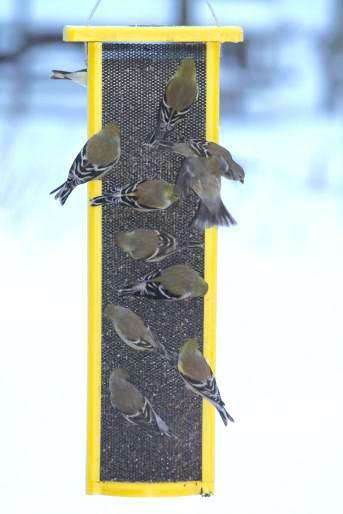 A tube feeder filled with sunflower chips attracts chickadees, titmice and finches. A platform feeder covered with mixed seed like peanuts, black oil sunflower and millet entices cardinals, jays and sparrows, while thistle feeders keep American goldfinches fat and happy. Finches happen to be resident birds in most parts of the country, unlike migratory birds who, well- migrate south for the winter. If you offer thistle (also known as nyjer seed) year-round, goldfinches’ vibrant yellow color will grace the yard in spring and summer. 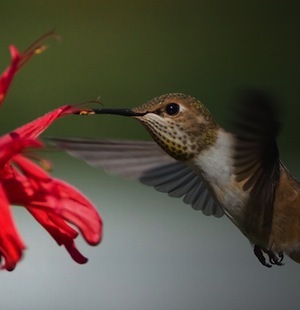 Duller, drab feathers in fall won’t deter them from feeders… it’s just the opposite! Thistle doesn’t germinate either, so no worries of weeds popping up below the feeder. The tiny black hulls can still pile up, but easy enough to scoop up every few weeks. There’s some great feeders out there and a lot of bad ones too. It’s easy to be drawn to the artsy fartsey ones. 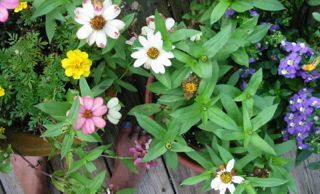 You may think a good rule of thumb is the uglier the better… not so! 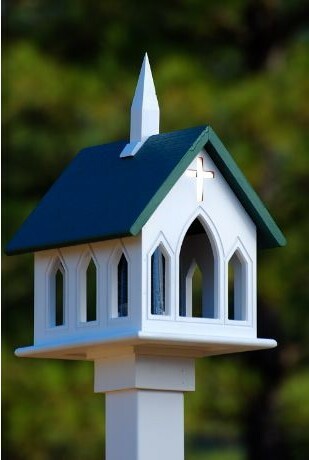 One shaped like a church or big porch swing is all about lasting for years, and our own experience is that the best feeders are made right here in the USA. No problem with imported products, but unlike gadgets and electronics, the best bird feeders are still made here. They should be easy to fill, but it’s more important that it be easy to clean. A good feeder is made to come apart so you can remove old or moldy food. Many folks buy large capacity feeders so they don’t have to fill them as often. 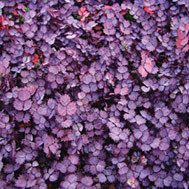 That can be a mistake sometimes as rainy weather spoils seed before consumption. Several small feeders may be a better choice than one that is extra-large, unless of course you’re talking about The All-Weather Feeder, it laughs at driving rain and snow! 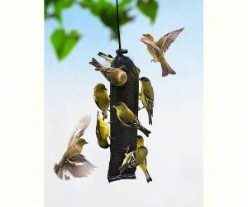 Wood bird feeders appeal to many people, and if cared for properly they will last. However, wooden feeders often fall prey to squirrels and get chewed up good! If you do happen to purchase any type of wood feeder, best to protect it… with sealant first and a squirrel baffle second. If you’re thinking about giving anyone on your Christmas list only one feeder, a thistle feeder is tops, or you could always opt for the talking calendar! 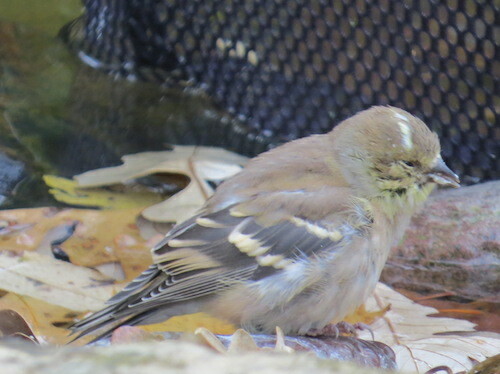 It’s an invasion of goldfinches… and pine siskins, and red polls and warblers and lots of other birds too lately! With the extreme cold weather, thistle feeders are being emptied at record rates, even Atlanta saw some of the white stuff, with more expected on Tuesday. So how do they do it? Fragile, tiny little birds surviving the most frigid conditions, day in and day out? I don’t know! Looking like puff balls, their feathers do trap heat for one survival tactic, and if they constantly eat all day, they’re able to store enough calories (energy) to hold them through the night. 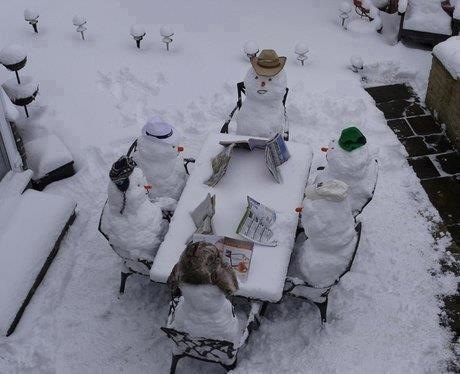 And yes, they can eat snow but it takes energy to convert it to liquid. Their daily struggle’s got to get old in these brutal winter conditions? Cardinals, bluebirds, woodpeckers, phoebes, a lone mockingbird, chipping sparrows and all the other usual suspects abound… and yet with snow on the ground! But it’s really just instinct when you think about it. Mother Nature equips all beings with this basic survival mode. She also equips some of us with the lunacy that the birds won’t make it unless you put food out twice a day… and have 3 heated birdbaths readily available 🙂 But we do it not only for the birds, but for our own satisfaction of feeling like we helped, and the simple joy derived from watching them. 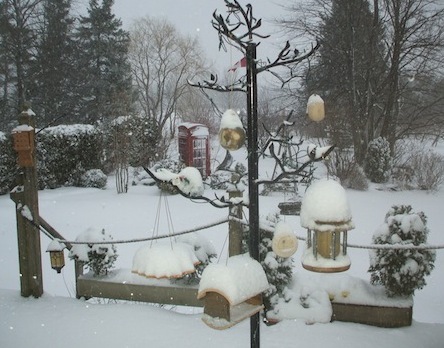 Should you reside anywhere old man winter’s got a death grip… please look out for feathered friends! 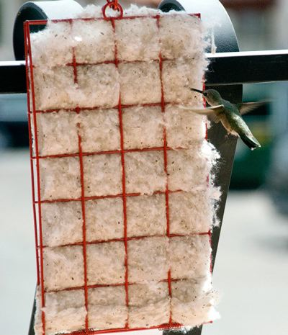 Keep feeders filled (and clean). 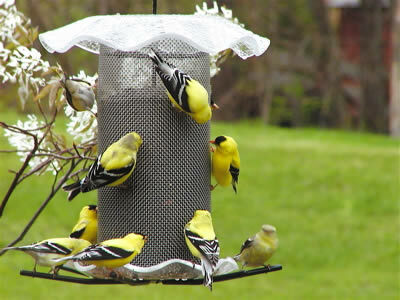 Larger than normal bird populations crowding feeders is one way disease is spread. Offer fresh water, birds will flock to a heated bath. You can purchase a heater separately and add it to your existing bath or even a shallow pan of water. Put out extra suet, easily make your own, form into cakes for suet cages, or crumbles for platform or dish feeders. High fat foods that are easy to digest serve birds well in freezing weather. Peanuts are ideal, as is plain old peanut butter. We smear some right on a tree trunk! Nuthatches, woodpeckers and warblers love it. Add an extra thistle sock for the crowds of finches. Relatively inexpensive, the black mesh thistle feeders are stronger and generally more durable than most. Visit our site and save 10% on any birding items through 2/28. 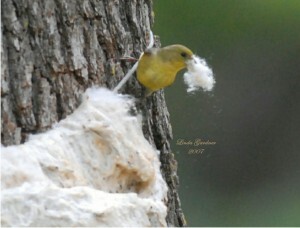 It’s a busy time for American Goldfinches as they have one of the latest breeding/nesting cycles of most backyard birds. They’re also one of very few breeds who actually molt twice a year and grow new feathers. Their electric yellow plumage is hard to miss, and most thistle feeders are seeing a good bit of traffic right now (provided the seed hasn’t gone moldy from all the rain). If yours is sitting with no takers – best to dump old seed, clean the feeder and replace with fresh thistle seed. 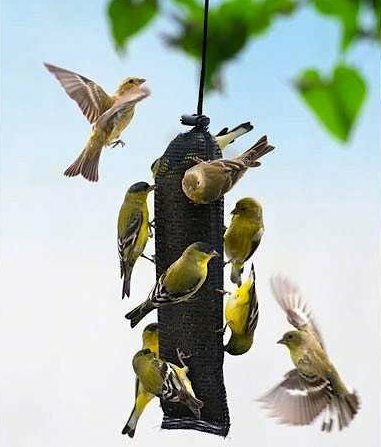 Innovative by design with quality construction (no cheezy plastic parts here) these 36-inch tall, large capacity thistle feeders have a cool spiral instead of perches. Featuring more feeder ports, birds really do “run the spiral” hopping from one one port to the next. This opens up space for more birds to join the party, no more waiting around for an open perch to catch some chow! Goldfinches feed babies thistle (or nyjer) exclusively. Gross as it sounds, parents chew and prepare the tiny black seed, regurgitating it into babies’ mouths. It’s not until juveniles are out in the world that they may start to discover and eat insects. There’s a kind and quiet demeanor about this favored songbird, you’ll rarely catch them squabble at feeders. Rather than fight for a spot, most will give up and maybe try again later. Hanging a few economical thistle socks helps to alleviate this problem during peak season. In fall when they molt again, their vibrant yellow plumage will give way to new olive drab feathers for fall and winter. It may seem like your Goldfinches have gone on their way and migrated south, but they’re still around! 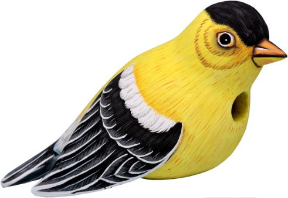 Keep thistle feeders out year-round to accommodate these resident birds, (and fresh water in a bath) and next summer that lemon yellow color will once again grace your yard. So popular these birds are, there’s even a birdhouse modeled after one… although typically they do nest in hedges or trees. thistle feeders hung by the chimney so bright? They make fun stockings for birding fanatics, but these thistle feeders are best hung outside for finches! Being creative is a great way to put some thought into a gift… because it is really supposed to be the thought that counts! With heavy duty mesh and velcro locking closures, you can bet they’ll be around for many seasons of use. Stuff these stockings with suet cakes, seed balls, or a bird food recipes book for swell birding gifts… and the very next day we can bet they’ll be in use! A non-germinating seed, thistle won’t sprout weeds, and squirrels usually leave these feeders in peace! 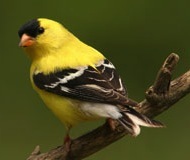 If you offer thistle seed (or nyjer) year round, Goldfinches’ electric yellow plumage will grace the yard in summer. Festive thistle socks make for quick & fun stocking stuffers too, and any backyard birder would be happy to get one. 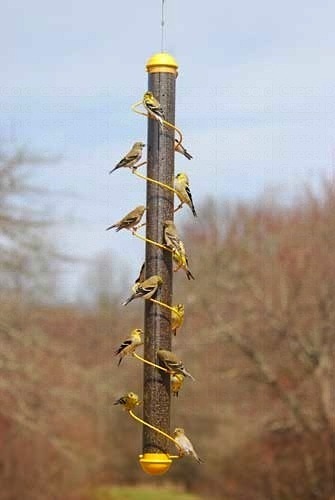 Because Goldfinches actually have busy season (late spring-early summer), adding an extra feeder or two always helps with demand. 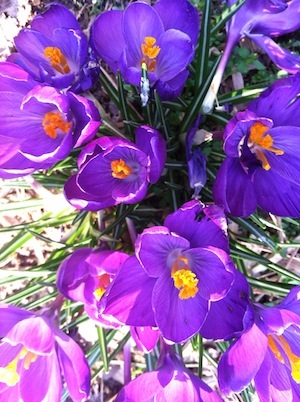 So roll up a few for your favorite nature geek today!